One of the main themes of In Search Of Alan Gilzean centred on my efforts to have him inducted into the Scottish Football Association Hall of Fame. It was, therefore, hugely gratifying to see him pick up his award in November 2009 and finally receive the recognition he so richly deserved for a wonderful playing career. His appearance at Glasgow's Hilton Hotel caused something of a stir at Tottenham and beyond. This was one of the first times his fans - and friends - had caught sight of him in almost two decades away from White Hart Lane. As noted previously, there have been quite a few expressions of interest about the book to the Back Page Press website. There are also a couple of contributions to the discussion thread on the book's Amazon website. To save you the bother of clicking away from the site, I've included them here for your perusal. I'm nice that way. "At last, this is long overdue. A true great who has never been given the recognition he deserves." "As a lifelong supporter of Dundee F C (I am now 72) and someone who knew Gillie well during his time at Dens, I would please ask that you e-mail me with progress on the forthcoming book." "Thanks so much for doing a book about Gilly. Whatever his self-perception, he ranks as one of Spurs' all-time greats, and it'd be great to see him at the Lane just one more time ..."
"I watched The King of WHL play almost every week of his Tottenham reign and he was sublime. The greatest game excitement wise I've ever seen, period, was the 4-3 win over Burnley in the FA Cup (when the FA Cup was the pinnacle of the game) in '66 when Gilzean was just amazing. We walked all the way home that night singing his praises - happy days!" ". . . And please amend the copy that says One of the best British strikers of his generation is a forgotten man. He might be keeping a low profile but for any of us fortunate enough to see him play - home or opposition fans - the complete opposite is true." "Not forgotten, not lost - at least to Dundee fans. He was up at a function recently, with others of the league-winning side!" 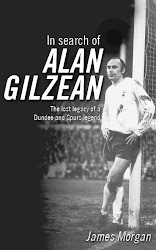 "Thank you for writing this book about Alan Gilzean. As a Spurs fan during the years Gillie played for them I had often wondered what had happened to "the king of White Hart Lane". He was a "one off" and a true footbaling genius. I hope that he will be available to sign a copy for me when the book is published, like many, many more Spurs fans I`m sure. I would like to think that THFC would be willing to host any book launch south of the Border but I`m happy to travel to Dundee - there are several trains per day from Kings Cross." Another match against West Ham, this time at Upton Park, which ended in a 2-0 defeat for Spurs. On the first occasion I watched this clip I was reminded of an interview Gillie gave in 1964 during his Dundee days in which he defended himself against accusations that he did not track back enough. There are three observations to be made here: the first is that the accusation could not be levelled at him in the highlights shown below, the second is that he looks ungainly doing so and the third is that Gillie's role in the Spurs team was changing. Having started his White Hart Lane career at centre-forward, he found himself increasingly playing as a support striker to Martin Chivers. Invariably, he found himself on the left or right wing more often and it had an impact on his goal output, although during the 1971/72 season he had one of his best at Tottenham registering 22 times. Despite the increased workload and the unfamiliarity of his new role, his partnership with Chivers flourished. Chivers to Gilzean throw-ins provided a rich source of goals for a team that would win three trophies in three years at the start of the 70s but Chivers was also the beneficiary from a series of Gilzean knock downs just as Jimmy Greaves had been previously. Greavsie and Gillie are reunited for the first time on a football pitch since the England striker's move to West Ham in a deal which also brought Martin Peters to White Hart Lane. It says much about how his stock had fallen that Greaves was included as a makeweight in the £200,000 transfer. Nevertheless, Greavsie's return revived memories of a time when the G-Men terrorised Football League defences during the mid to late 1960s. Greaves said of Gillie: "He was the greatest player I ever played with". The respect was mutual, Gillie claiming that Greaves was his favourite ever player. The clip featured here shows the two chatting happily before kick-off. They weren't just great friends on the pitch but off it too and some say their understanding was near-telepathic as a result. Gilzean scores twice in this game, the first of the 1970-71 season, but the clip ends before we see either goal, unfortunately. The match finished 2-2. Do any Spurs fans know whether Greavsie scored for West Ham? 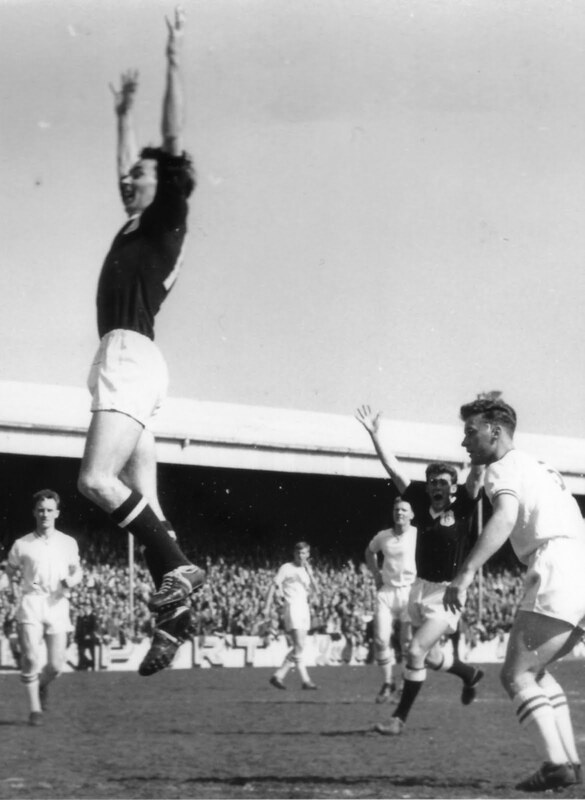 The Tottenham Weekly Herald claimed that this was Spurs' best performance since their European Cup Winners' Cup win over Atletico Madrid in 1963 and while Jimmy Greaves' sensational goal quite rightly drew lavish praise, it was the 'magnificent' Gilzean who proved the mastermind behind the victory. "The elegant Scot, twisting and turning with a flick here, there and everywhere was far too much of a handful for United's defence," read The Weekly Herald's report and Gilzean's marauding run for Tottenham's fifth seems to back up the claim. The report ends by saying that "Tottenham had shown once more that when the mood is upon them they are still the best team in the land". Nevertheless, it was to prove a season of crushing disappointment for Gilzean and Spurs. Soon after, Greaves contracted hepatitis and the club went on a dismal run of form. Indeed, the return fixture at Old Trafford ended in a 5-1 win for United. With Gillie clearly missing his strike partner, there were murmurs in the newspapers that Spurs were preparing to get rid of 'the elegant Scot'. But the press men had underestimated how much Bill Nicholson rated his centre-forward. "Alan Gilzean destroyed us on the day though, we couldn't get near him. Joe Kinnear was marking me, I remember, but we were so poor I ended up trying to keep with him as he came marauding forward from full-back. Gilzean was a superb player and I can understand the comparisons with Berbatov. They both have a lovely deft touch." Typically, though, Gillie did not take much of the credit. Humility was to prove a recurring theme throughout his career with him often shrugging his shoulders and saying 'it's just part of the game'. Thousands missed it because of the fog, including Willie Gilzean, Alan's father and Pat Liney, the Dundee goalkeeper, who deduced that it must have been his team-mates who were doing the scoring since, when the roars had gone up, the ball had not gone past him. Bob Seith's wife thought the scoreline was a mistake when she heard it read out on the radio that evening and Willie Waddell's sister groaned every time the ball hit the net. Some games enter club folklore simply by mentioning the scoreline. Rangers 1 Dundee 5 was one such match. Gillie took just five touches to score four goals and thus etch his name into history ever more. No game defined his Dundee career more succinctly than this one - not even during the European Cup run - and it seared his name into the Scottish football consciousness. Yet it would take another year for him to win his first Scotland cap, not least because some of the players who had been on the receiving end on that foggy day at Ibrox were selected instead of him. Back in the days when In Search Of Alan Gilzean was just a few half-thought-out ideas and a series of scribbles in my notebook, I toyed with the idea of writing it as a diary. Back then, I was daunted by the size of the task facing me and I was finding that the most interesting things about Gillie were what other people had to say about him and so it seemed the most natural way of conveying the idea that I was embarking on a voyage to find him. As time went on however, I came to the conclusion that, in the absence of a single substantive document of his career, there was a need for a chronology of his life too. The result is a book which I hope weaves my search and his life together. The proof of the pudding, I suppose, will be in the reading. Anyway, I thought it might be quite nice to give readers a flavour of what kind of things I was writing about when I started the diary. For point of reference, all dates refer to 2009. One paragraph, in particular, stands out: “Top honours did not elude him for long, and his most memorable moment to date is his goal for the SA White XI against SA Black XI.” At first, I'm staggered by this revelation. Two teams divided exclusively by colour, playing against each other? However, almost immediately, I'm struck by the realisation that it's not that far removed from an entirely Protestant Northern Ireland XI playing against a wholly Catholic Republic of Ireland XI. Martin has asked for my telephone numbers so that he can give me a phone. Those will be expensive phone calls. I begin to wonder just how big the biggest independent paint retailers in South Africa is. Things I have learned today: Alan Gilzean was the last Dundee player to complete military service. Indeed, upon making his debut for the club against Motherwell in September 1959 he had to dash back to Aldershot military base were he was stationed. Five months later he scored his first goal, a header in a 3-1 win over St Mirren. Given that he would become renowned for his aerial prowess, it was a sign of things to come. 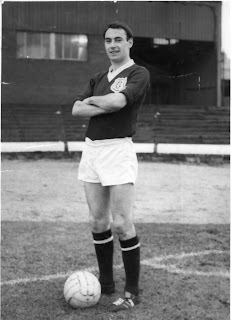 In 1962, he played a game against Falkirk wearing sand shoes because the pitch was icy. He scored twice. I'm reading a book about the Dundee title winning team of 1961-62 and I've just realised the magnitude of the size of the task I have undertaken. I had no knowledge that he had been on military service (although it should have been obvious to me since conscription didn't end until 1960) – it's just another area of Gillie's life that will need to be accounted for. Meanwhile, I'm starting to have nagging doubts about hagiography and the corroboration of evidence: one person's word is not gospel. Craig Brown told me that Gilzean would drive to training and matches because he lived nearby in Coupar Angus. The book claims that he lodged in Dundee. I'm starting to fill in some of the blanks about his days at Dundee, though. Gilzean joined Dundee as one golden era for the club was coming to an end and another was just about to start. Reading back over these entries, they seem fairly banal now. But back then they seemed like major finds. The big details were still to come though and as I picked up more and more from interviews I found myself turning to the diary less and less. Nonetheless, there are a few gems in them and I'll post more entries in the coming days. When I was a kid my mum and dad bought the children's book Masquerade by Kit Williams. The book was a beautifully illustrated treasure hunt which claimed you could reveal the exact location of a golden hare - buried somewhere in England - by deciphering clues contained in the pages. It sat on an old pine dresser in our living room, sandwiched between a couple of Roxy Music albums and David Attenborough's Life On Earth. Every once in a while I would lift it out and flick through the pages hoping the mystery would reveal itself to me. I used to stare at the picture of the golden hare for hours - looking back I think I must have been expecting it to speak to me. It never did. One of the central themes of In Search Of Alan Gilzean concerns his self-imposed exile from White Hart Lane. When I first started writing the book, I had thought that Gillie's time away from the club had been exaggerated and wondered why it was such a big deal. On the face of it, it didn't appear to be all that noteworthy but the more I spoke to his former team-mates the more I came to realise that there was something else to his enforced absence. It wasn't just Spurs players, either. His former Dundee team-mates told similar stories. When the synopsis of the book was first released there were a lot of Dundee supporters who questioned the claims contained in it - likewise with the first chapter. They claimed that Gilzean was a regular at Dens Park and that he had been included in the SFA hall of fame. They were, of course, correct. But what they hadn't realised was that parts of In Search Of Alan Gilzean had been written long before he had reappeared at Dundee or before he had been inducted into the hall of fame. In many ways, one was a consequence of the other. The reason for his time away from Spurs is less clear cut. I have my own theory - and like the location of Kit Williams' golden hare - it is carefully hidden in the pages of the book. You might find it on first read or you might read it several times and never see it. But the reason is in there. I can't quite believe it's 78 days to publication of the book but that's what it says on the online bookstores I keep visiting daily as I try to gauge interest in it. Back Page Press have informed me that there has been quite a lot of positive feedback via emails and other expressions of interest on Facebook and Twitter. One of the great concerns Gillie had about this book was that he felt no-one would be interested in reading it. How wrong he was. In the coming weeks, I'll be writing a series of articles on Gillie, my experiences with the book, his team-mates and other Spurs and Dundee related topics. But, until then, take care and please let me know if you have any suggestions for the site.